Borso d’Este (centre) hunting with his falcons. Our visit to Ferrara in July 2017 not only introduced us to a city with an interesting history, but also to the Ferrarese dialect. We had lunch at a wonderful restaurant called Cusina e Butega, which would be Cucina e Bottega in standard Italian (and Kitchen and Shop in English). We then visited the church of Santa Maria in Vado east of the city centre, with vado being the Ferrarese version of guado, a place where a river can be forded. A little bit further to the east, on the Via Scandiana, is the Palazzo Schifanoia. The rather unusual name of the palazzo derives from schivar (or schivare in standard Italian) la noia, ‘escape from boredom’. The Palazzo Schifanoia was the residence were the members of the d’Este family went to for some well-deserved rest and relaxation, and to escape from the hustle and bustle of the city. The palazzo was built at the end of the fourteenth century as a small, single-storey building intended for feasts and banquets. It was subsequently enlarged and embellished by Borso d’Este (1450-1471) between 1465 and 1467. Borso’s most lasting contribution to the building was the Salone dei Mesi or Hall of the Months on the first floor. 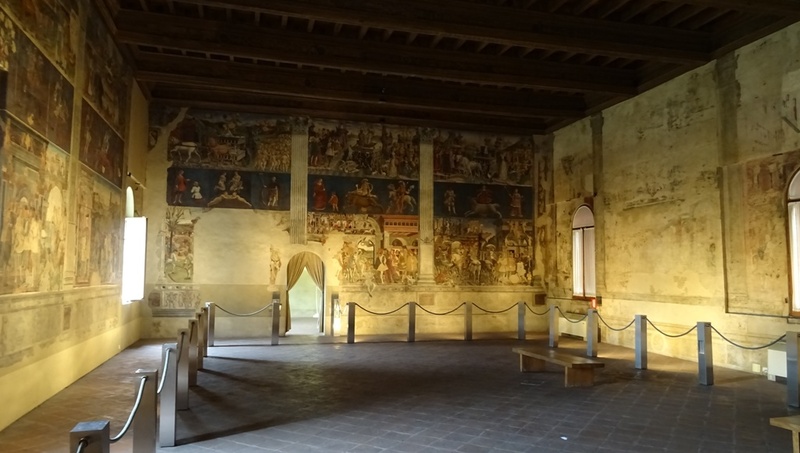 The walls of this large room – 24 metres long, 11 metres wide and 7,5 metres high – were frescoed between 1468 and 1470 by several of the best painters of the Ferrarese school. One of them has been identified as Francesco del Cossa (ca. 1436-1478). The young Ercole de’ Roberti (ca. 1451-1496) and many others were active here as well. Whether the great Cosmè Tura (ca. 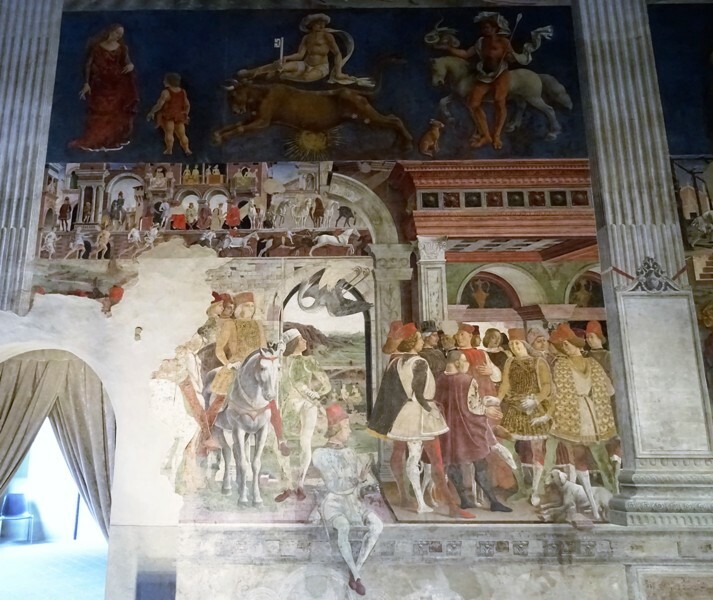 1430-1495), perhaps the best-known fifteenth century painter from Ferrara (see Ferrara: The Duomo), participated in the project is up for debate. His name is often mentioned, but concrete evidence is lacking. The painter Baldassarre d’Este (1443-1504) is credited with having retouched the images of Borso d’Este after his death. Interior of the Salone dei Mesi, with a view of the east wall. The artists partitioned the walls into twelve separate sections, divided by painted marble columns. Each section represented one of the months of the year. 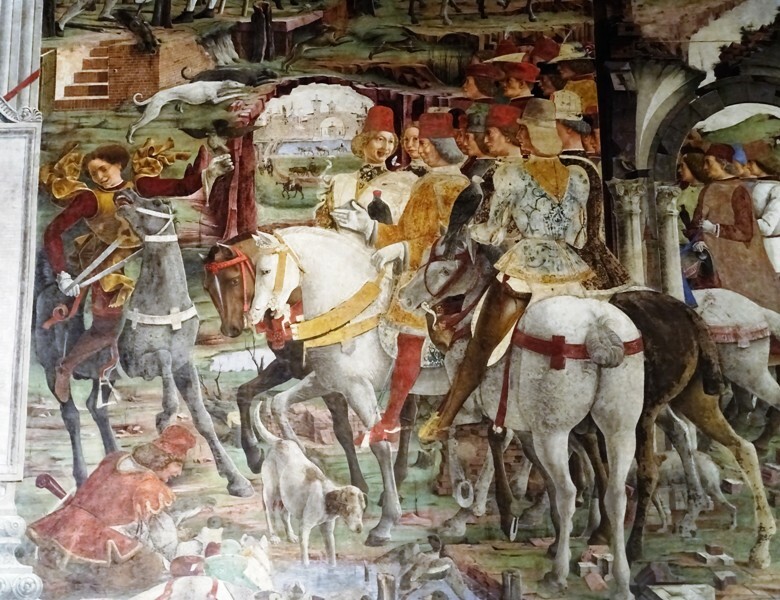 Regretfully the frescoes were neglected after the Estensi were expelled from Ferrara in 1598 (see Ferrara: Castello Estense). When the palazzo was later used as a tobacco warehouse, the walls were whitewashed and the images disappeared altogether. In the second quarter of the nineteenth century, the plaster was removed again and several of the frescoes were recovered and restored. We are fortunate that seven of the twelve months – March to September – can be admired today, even though not all of them are in mint condition. October, November, December, January and February are sadly lost forever; only a few miserable traces of paint on the south and west walls remain. This is probably in large part due to the different painting technique used here: a secco instead of true fresco. The month of April. Note the man in the centre ‘breaking the fourth wall’. The surviving sections are divided into three registers and need to be viewed anticlockwise. The upper register is about the World of the Gods and features one of the twelve Olympian (and pagan!) gods. Minerva, Venus, Apollo, Mercurius, Jupiter, Ceres and Vulcanus are depicted here. The middle register is an astrological cycle and can perhaps be compared to the one in the Palazzo della Ragione in Padova. It is in any case just as difficult to interpret, especially for those who are not well-versed in astrology. The lower register is by far the most interesting one. It features several scenes related to the life of Marquis and later Duke Borso d’Este. Borso is portrayed as a good governor, a benevolent ruler who enjoys simple pleasures such as hunting with his falcons. The best preserved scenes can be found on the east wall, which depicts the months of March, April and May. These are all attributed to the aforementioned Francesco del Cossa. The problem with the Salone dei Mesi is that it can be very dark inside. Little natural light flows in through the small windows, and as far as I could tell, there is no additional lighting in the room. Obviously you cannot take pictures with flash, so make sure you bring a light-sensitive camera with you if you want to take photos. 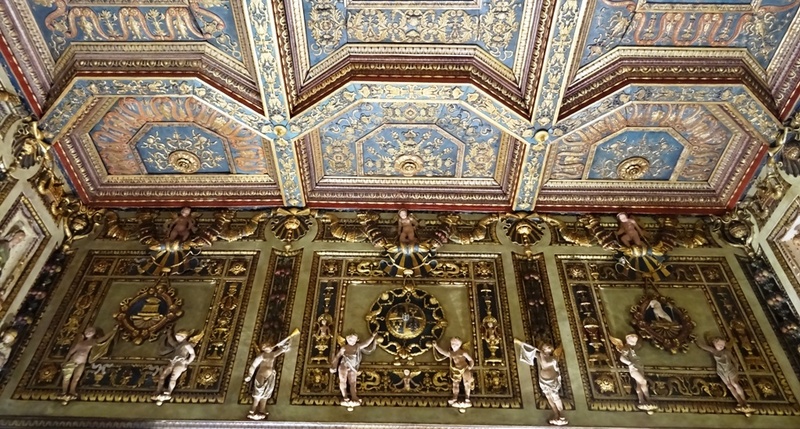 Next to the Salone dei Mesi is the Sala delle Virtù or Hall of Virtues, with a beautiful ceiling and statues representing the cardinal and theological virtues. The fifteenth century sculptor Domenico di Paris from Monselice was responsible for the decorations in this room. More information about the Palazzo on Ferrara’s official website (here and here). Italian Wikipedia has a detailed article about the Salone dei Mesi. Said to have been a son of Niccolò III d’Este (1383-1441) and thus a half-brother of Borso. However, Niccolò died on 26 December 1441, so if he was indeed Baldassare’s father, then the latter cannot have been born in 1443.